Declan Rice was first brought into the West Ham senior squad by Slaven Bilic when he was barely 18 years old. The reason was seemingly because the defender was impressing so many with his performances for the Hammers’ reserve side. But his talent had caught the eye well before that. He’d been an unused substitute earlier in the season and was included in the tour party that visited the United States in the summer of 2016. His potential was clear and his club acted upon it quickly. So, why did it take the Republic of Ireland until March of this year to give him a chance? Given Rice’s eligibility for England, why wait so long before bringing him into the senior team? There’s a naivety there, of course. If there was some doubt or concern from Martin O’Neill and the rest of his coaching staff regarding potential England overtures then why not take Gareth Southgate out of the equation entirely? If Rice has long been seen as integral to future Irish sides and earmarked as a certain senior skipper for years to come, why was the risk not mitigated and the defender nailed down as soon as possible? The home qualifier against Moldova last October springs to mind. Rice had already made his first West Ham start months earlier against Southampton and had racked up six appearances in total by that stage. He had already been called into the preliminary Irish squad for the summer clash against Austria but was ignored for the Moldova fixture. Instead, he was on Under-21 duty and the decision by O’Neill not to cap him now seems short-sighted. Sure, with the team having to push so hard to try and reach Russia, each game was crucial and a potential banana-skin. But, that night, the Irish were 2-0 up after just 19 minutes. The result was never in doubt and giving Rice a minute or two as a late substitute would’ve meant avoiding the current mess. O’Neill’s recent comments can only be greeted with a raised eyebrow. “I’ve said from the beginning that until something is nailed down, it’s never over the line,” he told reporters on Monday. But there was an ideal opportunity to do just that last year and it went ignored. It seems as if nobody learned anything from the Jack Grealish saga. There was a chance to bring him on the summer tour to the US in 2014 and the teenager delayed his holiday plans to see whether O’Neill would select him. He didn’t and the scrambling that followed the next year was too little too late. Talented young players are a precious commodity and don’t come along very often, particularly within Irish circles. But in both the Grealish and Rice examples, it seems like frustrating short-termism. Is there anyone thinking two or three steps down the road? “Declan has loved it with us”, continued O’Neill, in an attempt to dilute the main news-line and offer some crisis management spin – a reminder that the Republic of Ireland camp is great fun. The statement sounded, ironically, so very Irish. While everyone was having a party in the front room, the Football Association were sneaking in the back door and getting in Rice’s ear. There are other things at play, obviously. Rice’s new agent – Neil Fewings from Wasserman Media Group (WMG) – has been busy. He advised his client to turn down West Ham’s offer of a new deal in the summer and is now clearly pushing him to declare for Southgate’s side. There is a huge financial gulf between being a senior international for the Republic of Ireland and England. Commercial opportunities are one thing but there’s also a player’s price in the transfer market. It comes down to money and value and worth. Also, perhaps most importantly, everything revolves around a very grey topic: identity. That’s not just a football issue but a wider social conversation that has more questions than answers because the world changes and things evolve. When faced with an option, everyone is allowed change their mind. The comments from Kevin Kilbane and James McClean are completely unhelpful because they have no idea of the situation Rice is in. In Kilbane’s case, he always knew he wanted to play for Ireland. The same goes for McClean. But what if you have doubts? What if you’re not sure? What if momentum takes you in one direction and then another opportunity is presented to you? What if you identify with two countries? Or three? What if you got so caught up with how your family felt about you playing for a certain team that you allowed it sway your decision? 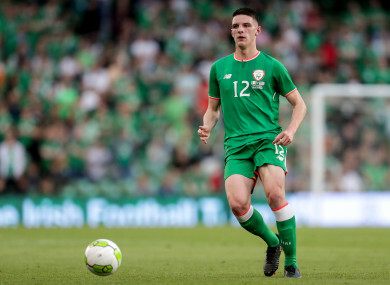 It seems impossible for Rice to declare for Ireland now so the abuse and criticism and condemnation of the 19-year-old won’t be slowing down anytime soon. But, what we should expect instead is an explanation of why Rice wasn’t capped at senior level sooner and how the FAI will handle these situations moving forward. If they feel aggrieved that their English counterparts have swept in and taken what’s theirs, then they need to become more ruthless. Ensure England don’t have that opportunity. Remove it as an option. Act quickly. Be better. Otherwise, you can’t feel bitter and disappointed when things don’t go your way. This is football. We’re a long way from the moral compass. “We would all prefer to stay in the safety of the civilized world,” Rice’s agent Fewings told ESPN last year. Email “'While everyone was having a party in the front room, the FA were sneaking in the back door and getting in Rice's ear'”. Feedback on “'While everyone was having a party in the front room, the FA were sneaking in the back door and getting in Rice's ear'”.